Being a Fitness Professional who also loves to dabble in yoga, when I came across this book it was as if it was meant for me. After taking the Supple Strength course with the YMCAfit last year, a blend of yoga and Pilates, this book was the perfect resource for me. In two parts, this book covers the history of yoga, philosophy and Hatha Yoga – then applying the principles of yoga to modern living. Part one delves into the origins of yoga with descriptions and explanations of everything related such as the schools of yoga, the four sects then into the eight limbs of yoga (also known as ashtanga yoga). It’s fascinating to see the meaning of many words I have come across in the yoga world and get a deeper understanding of where it all started. The Asana’s – physical postures – are just one limb of yoga? For many, this is the starting point in yoga. The book goes on to talk about the body and mind according to yoga. Om an it’s significance is something that is covered and highly interesting to me. The final section of part one covers Hatha Yoga. I had never tried Hatha yoga until just a week ago. It was a less intense, less vigorous form of yoga than I have gotten used to. It was the perfect class after Crossfit and other workouts I have done recently. Drishti – is a focusing technique that assists with looking inwards, towards the self. The book then covers the asana’s of Hatha Yoga including (but not limited to) variations, benefits, precautions, teaching points and modification. The images are presented in colour which is something I love. The asana’s are a large proportion of the book which then talks about breath work / regulation and control. Before wrapping up, session structure, general flow sequence, health and yoga philosophy in modern living are covered in part two. 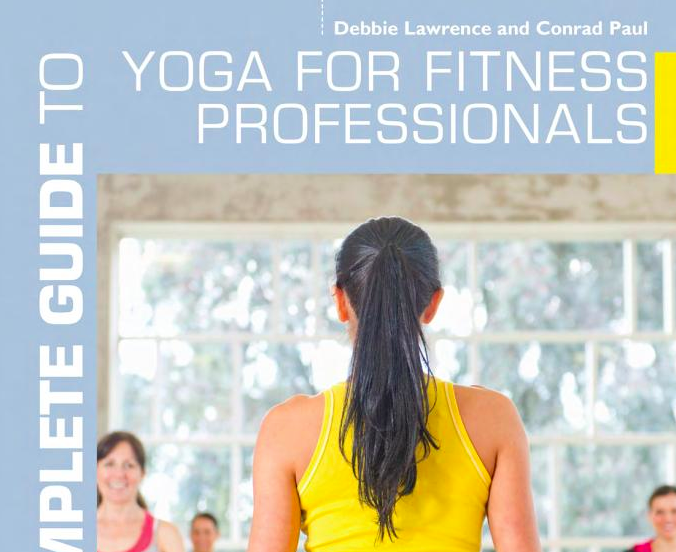 Written by Debbie Lawrence and Conrad Paul, the book is a great resource for Fitness Professionals. It’s given me a place to reference when wanting to include a relevant posture in my classes to aid stretching, strength or flexibility. I’ve also used the asanas as a starting point for “creating” different functional drills based on the asana. Are you a fitness professional with a passion for yoga?! Do you like fitness classes with yoga fusions?! I did a course called Supple Strength too which was a great mix of fitness / yoga / pilates! …Everyone just needs to find the type of yoga that "does it" for them 🙂 it took me a while too!